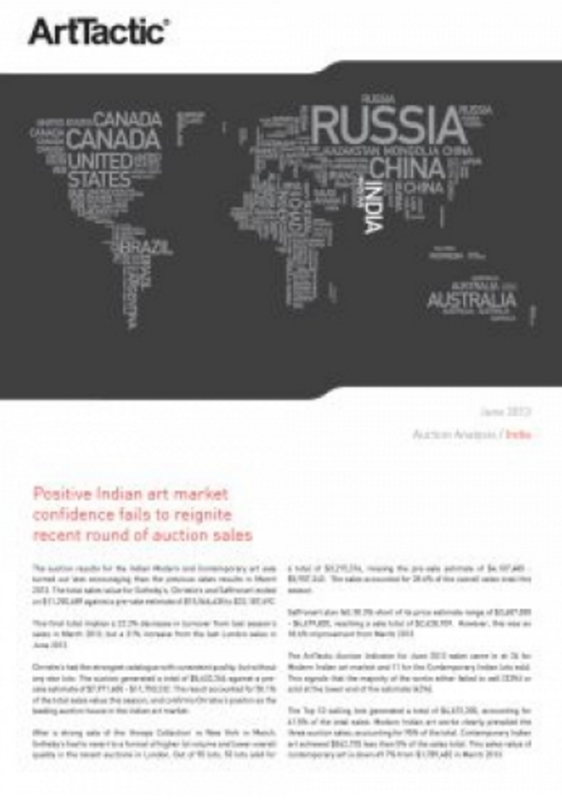 The auction results for the Indian Modern and Contemporary art sale turned out less encouraging than the previous sales results in March 2013. The total sales value for Sotheby’s, Christie’s and Saffronart ended on $11,250,689 against a pre-sale estimate of $15,566,635 to $22,187,692. This final total implies a 22.2% decrease in turnover from last season’s sales in March 2013, but a 31% increase from the last London sales in June 2012. Christie’s had the strongest catalogue with consistent quality, but without any star lots. The auction generated a total of $5,632,264 against a pre-sale estimate of $7,971,600 – $11,750,232. The result accounted for 50.1% of the total sales value this season, and confirms Christie’s position as the leading auction house in the Indian art market.